"Starts From: November 6th, 2015 Until: December 7th, 2015"
Revel in the pampering treatments of an expanded wellness spa, shop the hottest trends from top designers at our shipboard boutiques, and enjoy dynamic full-scale productions in a multi-tiered show lounge. Silver Whisperluxury cruise ship has it all. Design your own schedule … or no schedule at all … Silver Whisper. Taking Silversea’s award-winning concept of all-suite luxury to the next level, Silver Whisper – is slightly larger, yet retains the familiarity and intimacy of Silversea’s two earlier ships. Aboard the Silver Whisper cruise ship, savour a convivial cosmopolitan ambience and many special amenities usually found only on larger ships, including boutique shopping; a wellness spa with beauty salon, fitness centre and sauna; full-scale productions in a multi-tiered show lounge; an Internet Café and WiFi service from stem to stern. "STARTS FROM: NOVEMBER 21TH, 2016 UNTIL: DECEMBER 22TH, 2016"
Silver Spirit, Silversea’s newest and largest ship, combines the award-winning hallmarks of the Silversea luxury cruise experience with expanded amenities and exciting new venues for dining and entertainment. Dine on fresh sushi and innovative Asian fusion cuisine at Seishin, meet friends at Stars Supper Club for small plate specialties and live entertainment, or recharge and rejuvenate in the 8,300-square foot spa and fitness center of the Silver Spirit. Featuring the largest suites in the Silversea fleet, Silver Spirit offers a lively, convivial atmosphere for cosmopolitan travelers who enjoy a greater variety of shipboard diversions, yet crave the personalized service and authentic and “up-close” experiences for which Silversea is known. More ways to play … and to relax … Silver Spirit. "STARTS FROM: NOVEMBER 20TH, 2015 UNTIL: DECEMBER 7TH, 2015"
Al fresco dining with panoramic ocean views. Warm clubby spaces for evening cocktails with friends. The plush comfort of your ocean-view suite after a day of incredible sights. 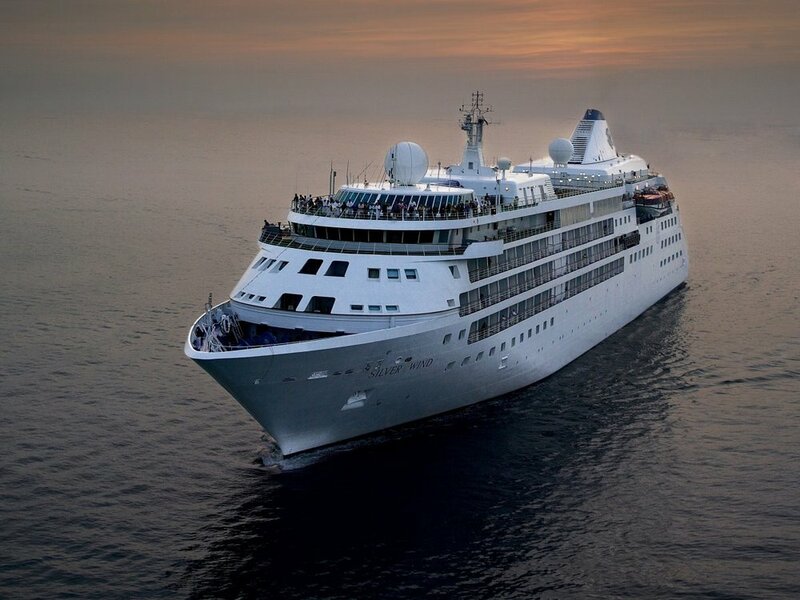 Welcome home to the luxury cruise ship,Silver Wind. Warm welcomes and gracious personalized service inspire our guests to callSilver Wind their “home away from home” - join us and discover the charms of Silver Wind. Second in the Silversea fleet, Silver Wind is much like Silver Cloud and a shining example of intimate, elegant cruising. As spacious as a grand hotel, as gracious as a best friends’ home, the lifestyle on board Silver Wind is one of fewer guests, more space and features Silversea’s renowned personalised service.Recent Silver Wind ship refurbishments include upgraded interiors and enticing enhancements that include a new ocean-view spa, new Observation Lounge, and eight new suites.